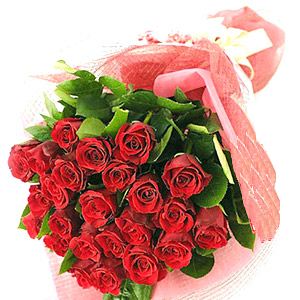 Send Enchanting Rose Bunch to Chennai. Gifts to Chennai. Send Flowers to Chennai. Description : Flowers make wonderful gifts for any occasion and festival as it can brighten any one’s day. Moreover, vibrant rose bouquet are by far the most popular gifts. Thus, if you are searching a gift for your loved one in Chennai which will not only bring a smile on the recipient's face but will express your feelings of love and admiration then this beautiful bunch of 24 roses will be just perfect. Wrapped beautifully and tied with a ribbon, these roses will definitely be a big hit with your dear one. Thus, send this hamper to your dear one along with other Gifts to Chennai and give them a pleasant surprise. Moreover, Gift2Chennai.com ensures a safe and secure delivery of your gifts.